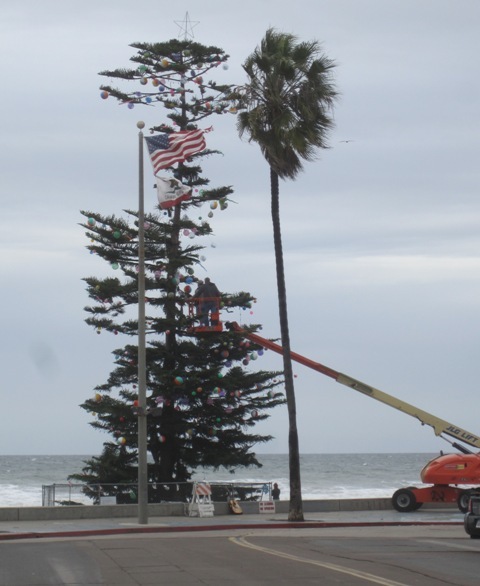 Lots going on this Christmas season on ol’ Newport Avenue, the main street of the Ocean Beach village. We do an occasional newsy review of the comings and goings among the shops, stores, and merchants on the avenue, so here then, is our latest Newport News from Tuesday, December 18th. 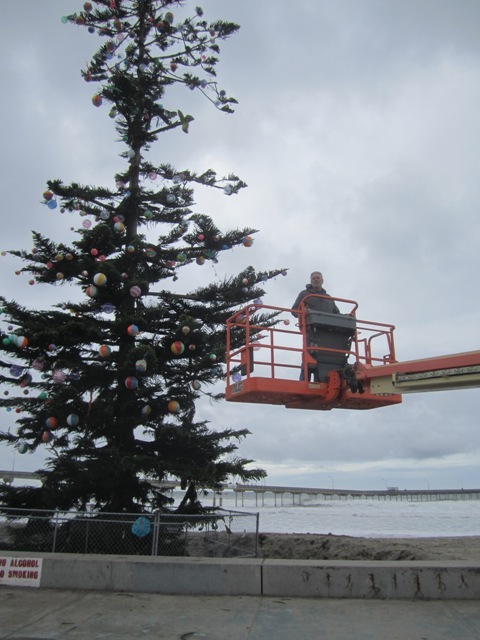 Mike Colpo, a volunteer with the OB Town Council, and chief OB Christmas Tree decorator, was having troubles with the lights on Tuesday. The top half of the lights had gone out and he had to check the bulbs. But this was no ordinary tree with ordinary tree light problems. Mike told me there was nearly a quarter mile of Christmas light strings, attached to the sagging limbs of the tree with over 300 zip ties. He said the tree was in shock and starting to go limp. And he had to wait for Zed Electric to assist him with his tall tasks. When I walked past the old El Rodeo Mexican place, the fastfood institution below Ace Tattoo, I was in shock – it was gone. Yet there were spanking brand new wrap-around wood benches outfront so I stopped and spoke by phone with the owner of a new place going in. John Rudolph is opening a new place, a sandwich shop that will sell fish tacos, fish salad, and soups. El Rodeo closed about 3 weeks ago, and Rudolph has people inside cleaning up and setting up his new establishment. He plans to call it the “Newport Avenue Yacht Club” and will only have 4 to 5 main items on its menu. Those new benches that John had built sure are sparkling neat. Moving on down (or up) Newport, I checked in at the Newport Pizza place, and spoke to a couple of the guys on duty there. They assured me that their boss, Mike Tharan (unsure of his spelling), was still planning on opening a more upscale beer place across the street, in that two-story pink building that once housed the infamous Inbetween drop in center where I worked in my youth. 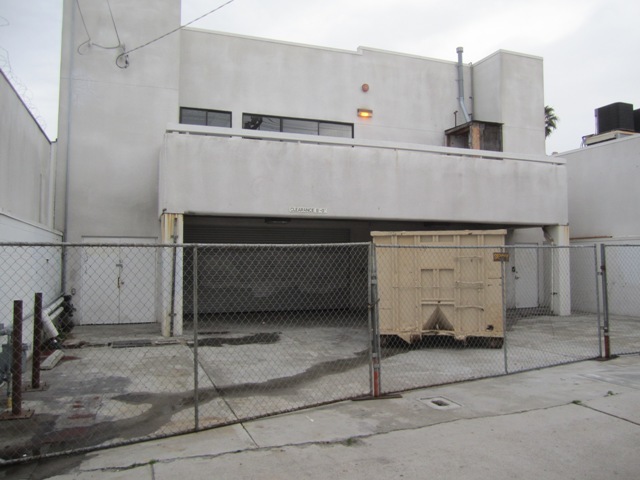 The OB Brewery will open, I was told, sometime in late 2013 or early 2014, and that right now the insides are being gutted. The beer joint will include a roof access patio and offer ocean and sunset views. Next to Gallagher’s Irish pub, there used to be a clothing store that had been there for years and years (I cannot recall its name). It was run by a woman I met who went to Point Loma High School years ago, I believe. 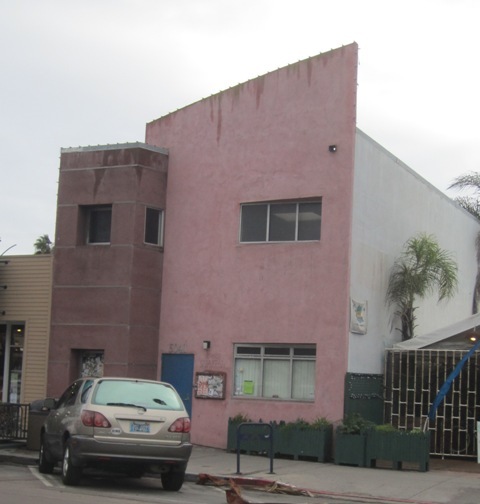 It was gone and the storefront at 5040 Newport is now vacant. 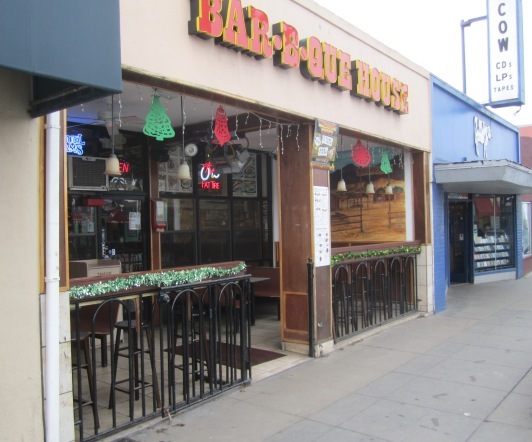 I managed to speak with Abdoul, the owner of the BBQ House whom I’ve known since he had a small place next to the old movie house on Newport. He says he is still planning on expanding his eatery into the space now housing Cow, the record and album store next door. These plans have been in the works for at least a year, and he told me “next month” when I asked when. How appropriate, a barbeque place consuming a cow. Speaking with one of the employees at Cow, he told me that Greg the owner has two other establishments. 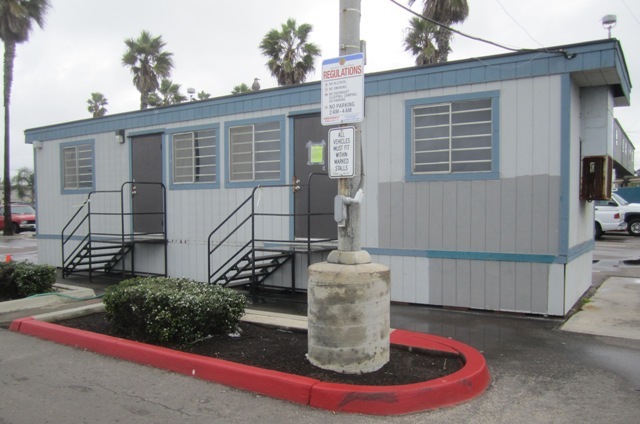 Obviously, Greg has known about Abdoul’s expansion plans for awhile and has had a chance to expand and diversify himself, geographically speaking, as he has another outlet in Pacific Beach. 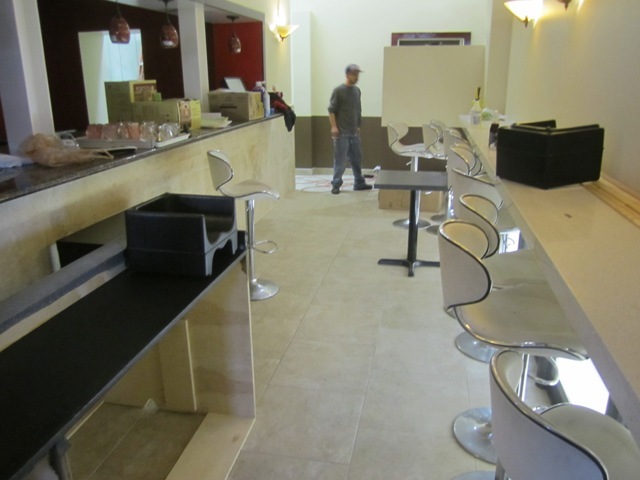 Inside the new OB Kabob. Just off the corner of Bacon Street and Newport, another new eatery is going into what used to be Seth’s Chop Shop. 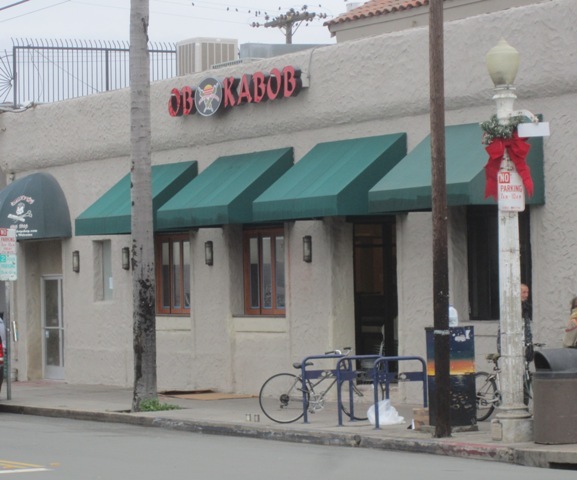 The OB Kabob, owned by Sam Ibrahim plans to open in January. Workers are busy remodeling the insides and it does appear that it could open in a month or so. Seth’s shop moved across the street in the arcade building about 2 years ago I was told by a woman sweeping the floor at the hair stylist’s place. 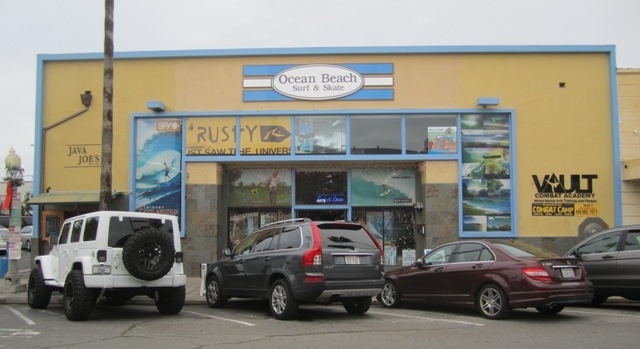 Everyone I’ve talked with about the eminent closing of the Apple Tree Market know that the store’s owners want to re-open their market at the building they own on Newport – which now hold the OB Surf and Skate shop. Jody, the clerk staffing the counter at the skate shop told me they plan to move over to Niagara Avenue in the old electronics building. They’ve been at their current location, the old Paper, Rock, Scissors building – which if you’ve been around long enough, you may know it as the old Bank of America building – for 3 to 4 years. 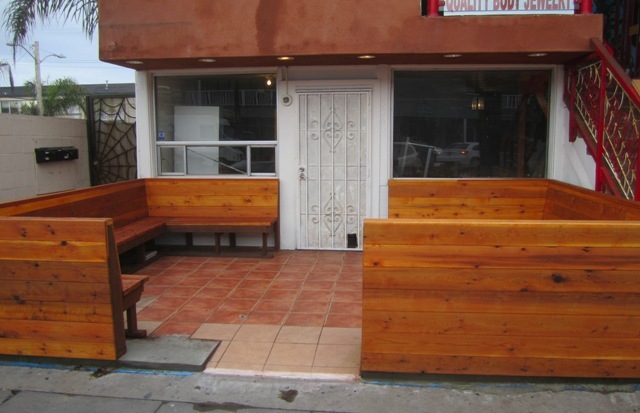 Roger, the owner, installed a skate bowl and wall ride in the building back in February 2011. All that will have to go, including the small Java Joe counter/ window and the Vault martial arts guy. 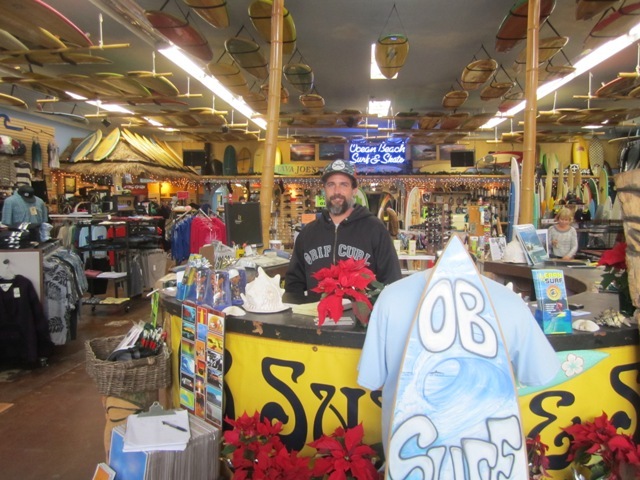 Jody at OB Surf and Skate. 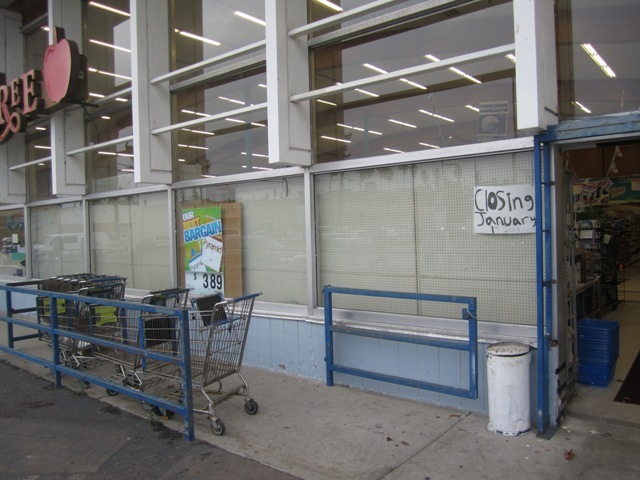 Over at the front of Apple Tree, there is a hand-drawn sign that confirms the market’s closing January 1st. I spoke with one of the employees and asked her what her plans were. She wasn’t certain, although some of the workers plan on working at the new store on Newport once it opens. 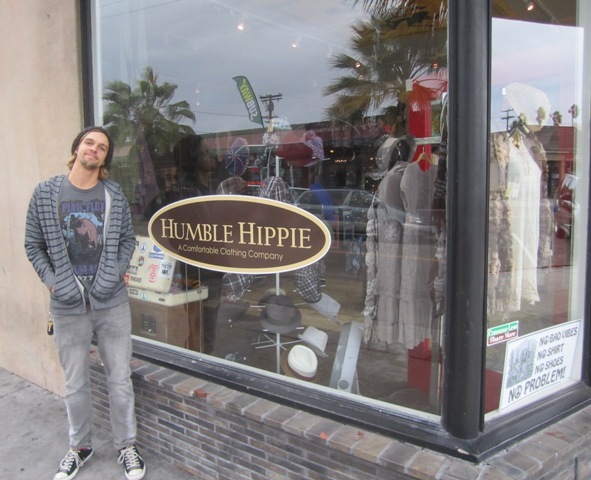 One of the newest and visible stores on Newport Ave is the Humble Hippie that took over at the storefront at the corner of Cable and Newport. Wes Young outside his Humble Hippie. I met one of the owners, Wes Young, inside, who was working this day and is young. His partner in the enterprise is Dusty Ray. They opened 3 months ago, in September. We both agreed that the high-end antique place that used to be in the space seemed inappropriate for OB. I asked Wes if he had spelled “hippie” correctly, and he laughed, and I wondered if his parents were or had been hippies. Over at LastDays Tattoo, I met the owner, John Tieker, who displays his art and the art of his artists up on the walls of his slender storefront. I asked John if he was getting a lot of business these days from those who believe the end of the world is near, what with a name like he has for his business. But he simply said no. He has been in this location he said for two years. 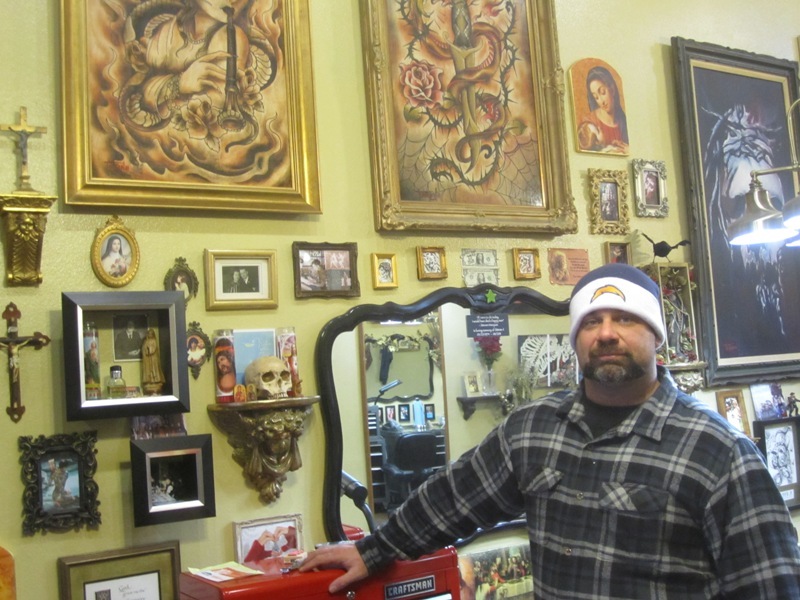 Tattoo artist and owner John Tieker with some of his displayed art. De in front of the Thrift Trader. 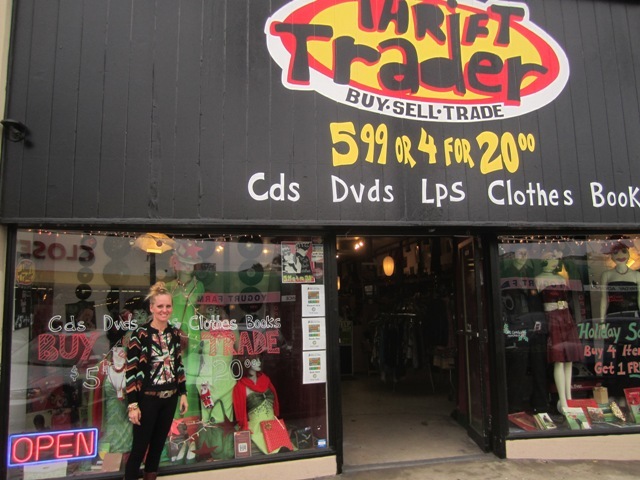 Another new store on Newport is the Thrift Trader. I was told by clerk De that they’ve been open now for 6 months. The place is owned by Jeff Clark who also owns “2 Dollar Thrift” just down the street. Clark also has 2 Dollar stores in PB and North Park. Hovering over a client, Cash Scott, artist and owner of Chapter 1, explained that he bought out the former tattoo parlor, Full Circle, which moved to South Park, and had worked for its owner for years before he laid out the cash and got the place for himself. His partner is Tomas Archulate. The client, Jeff, allowed me to photograph him and Cash as the artist worked away on his skin. Tattoo artist Cash Scott working on Jeff. 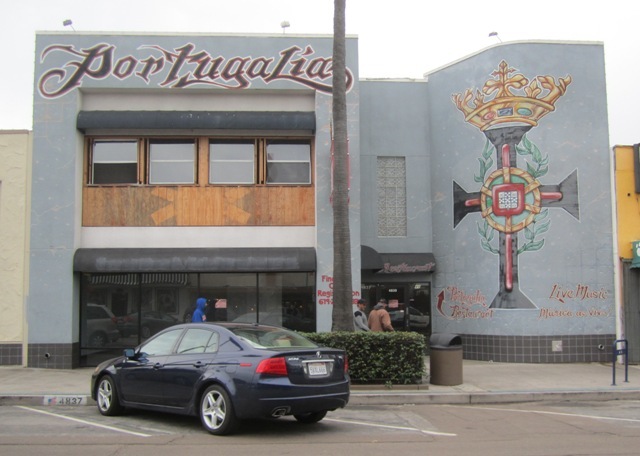 There was no one on hand to confirm that the Cohn Group had bought the old Portugalia restaurant at the top of the business blocks of Newport Ave. Although neighbor Gary Gilmore told me that the Cohns had made the purchase, and that workers had been busy filling up the dumpster in the back. Several women employees of the bank next door said they had seen “suits” inside the place but when queried, the suits shut up and wouldn’t tell them anything. This would give the Cohn Group two places in OB. Wow. Alley view of the building. Looks like someone has been busy. My girlfriend has extensive work done by Cash, and Tomas is currently working on an entire front torso piece on myself at Chapter One. They are extremely creative, professional, and they are people we consider genuine friends. If anyone is thinking about tattoo work, I highly suggest stopping by their shop, seeing them at work, and asking some questions! I think I speak for most of the merchants when I say “Thanks Frank. Good report.” Most of us are stuck in our shops and don’t have a chance to walk up and down Newport to see whats going on. I appreciate the time you take to keep us abreast of the changes. I like what I see. This little town just keeps getting better and better. Cheers! Gary, thank you. It is important for all of us who care about this small village to keep track and understand its changes, both positive and negative, and for the merchants and residents to know who their new neighbors are.